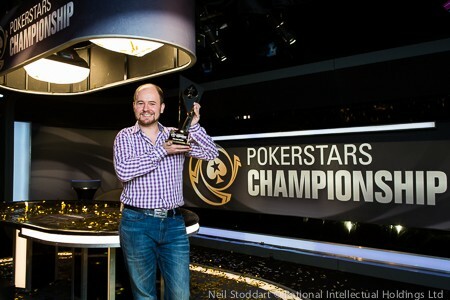 The first major PokerStars tournament to be held in Russia is over, and tonight a 30-year-old professional player from St Petersburg named Pavel Shirshikov hoisted the PokerStars Championship Sochi Main Event trophy. Pavel Shirshikov wins more than 29 million rubles–around $500,000–which is the lion’s share of the guaranteed 150 million rubles prize pool. He beat a field of 387 to record the single largest score of his career. The thing that’s most surprising about Shirshikov’s triumph is how dominant it turned out to be. It really shouldn’t have been a surprise at all. Back on Day 4 of this six-day tournament, Shirshikov knocked out the American pro Jason Wheeler in an enormous pot, taking the tournament chip lead with 32 players left. Shirshikov was still leading at the end of Day 5. Then he was second by only the tiniest margin heading into today’s finale. This victory had been in the mail for three days. However, he also said that he was delighted to be the first Russian winner of a PokerStars Championship event, adding that he had already received an SMS from his mother asking for a Mercedes-Benz. We don’t know yet whether he’s called a car dealership. Perhaps the only reason tournament officials hadn’t handed over the first prize–and Mrs. Shirshikov’s car keys–all the way back on Monday is the continued presence in the field of a man named Vladimir Troyanovskiy–otherwise known as Russia’s premiere poker export. Troyanovskiy is a fixture on the final tables of all of the major PokerStars events, including Super High Rollers, High Rollers and side events. He has never been closer to a Main Event triumph than this, however. He got all the way to heads-up play. But then with a dinner break looming after a near nine-hour grind, Troyanovskiy and Shirshikov played a number of big pots to decide which of them would take the top prize. Troyanovskiy threatened to overturn a massive deficit, doubling up twice from behind, but it was third time lucky for Shirshikov who managed to get a better hand to hold. That left Troyanovskiy with a second-place finish and 18.45 million rubles. Shirshikov, who plays online at PokerStars as OMGinmarsat8, now has a name known across the poker-playing world.